When everyone thinks fly tying, they think artsy dry flies or classic atlantic salmon patterns with crazy color schemes and exotic materials, but it doesn’t have to be as complex as it looks. 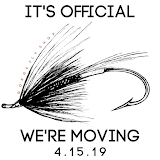 This post is for the people that are intimidated to get into fly tying or have tried it and gotten too frustrated to continue, from one novice to another. There is nothing wrong with fishing a ‘bad tie’. If you think a fly you tied might be subpar with what you would consider fishing, don’t count it out. When it comes to trout, we like to think they have a reflex when it comes to feeding. A good buddy of mine told me a great analogy for how he thinks trout feed most of the time. Say you’re walking in your home, and you look down to see something black with legs, about the size of a quarter. You immediately think “oh crap that’s a spider, I better smash it!”, but at a closer look you realize it was just a piece of lint. Now put yourself into the mind of a trout in a feeding lane, you’re posted up on a juicy seam and you look up to see something black with legs, about the size of a quarter. You immediately think “oh crap, that’s food, I better go eat it!”. Next thing you know some guy in a backwards hat and cargo shorts is taking pictures of you with his fly in your mouth for instagram. ‘Presentation over representation’ is something that I try to remind myself religiously. To put it simply, when it comes to a majority of trout, presenting your fly matters a lot more than what’s on the end of your leader(although in some situations, flies really matter). 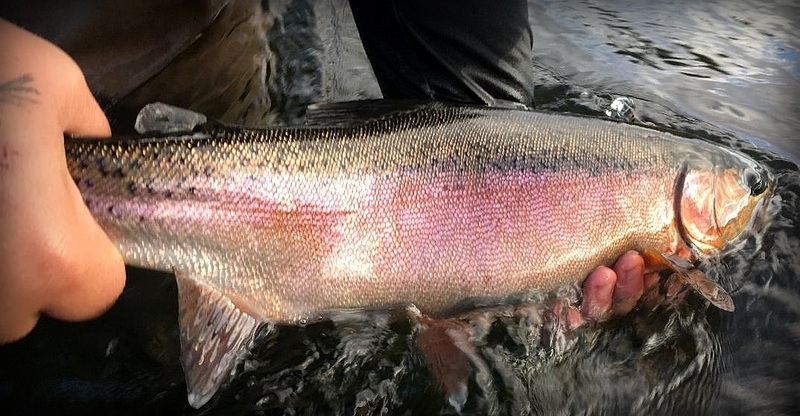 In short, you flies don’t have to be picture worthy to be fish worthy. When I first started tying, one of my biggest problems was material organization and paying attention to following steps to certain patterns. One thing that has helped me a lot as a novice is separating my materials into categories, i.e. Maribou and chenille in their own bags, hooks and beads in the others. When I first started tying, all my stuff was piled into one bag. Whenever I went to grab something I needed it ended up with me picking everything up off of the floor due to the bag exploding. It took me a very short time to figure out a better way to store things. I evolved from one bag to multiple bags, to finally, a container system. It used to take me forever to tie the simplest of flies, because I never prepped any of my materials.Say I want to tie a few wooly buggers, nowadays I have separate piles of hooks and beads, maribou and chenille, that way I can just grab and go, step by step and not have to fumble with materials while I knockout a tie. Getting creative with your fly tying doesn’t mean you have to come up with something innovative or next level (props to you if you do though). Being creative can be as simple as using a different color hackle on a small dry fly, or throwing rubber legs on a plain jane wooly bugger. 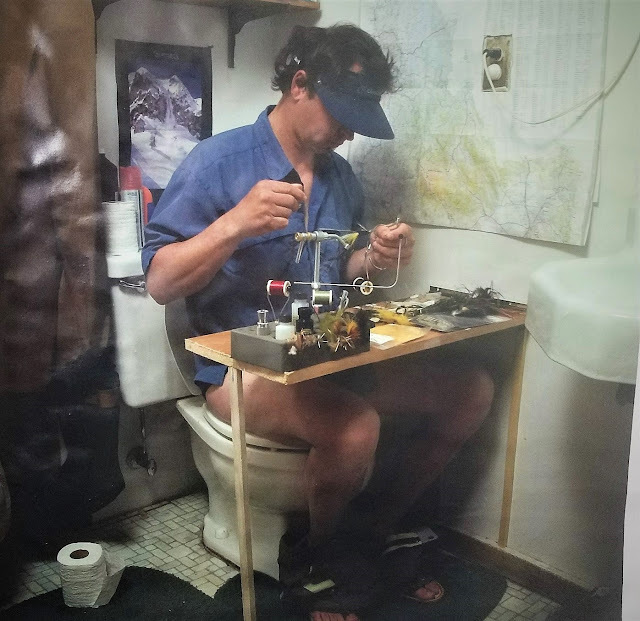 Thinking out of the box is what makes fly tying so awesome. There’s no set rules on how you have to tie something, no one is going to bust your door down and tell you “you can’t use that on that fly!”. Some people will go as far as to judge you on your flies.They may tell you “there’s not enough of this,” or “there’s too much of that.” instead of paying attention to negative criticism, surround yourself with friends that tell you “I’d eat it!”, more often than not these people will help teach you and push you to become a better tier, compared to those who will judge and dissect everything that leaves your vice. In the end, the fish themselves are the ultimate judges of your creation. Pay attention to fish behavior when fishing a home tie. There’s 3 basic answers a fish will give you. 1, The preferred answer: An aggressive take. Looks like your fly worked, soak it all in. 2: The fish will ignore it completely, meaning it might not want the style of fly you’re throwing, be it nymph vs. dry vs. streamer etc… The 3rd and anything from final answer is an outright refusal. 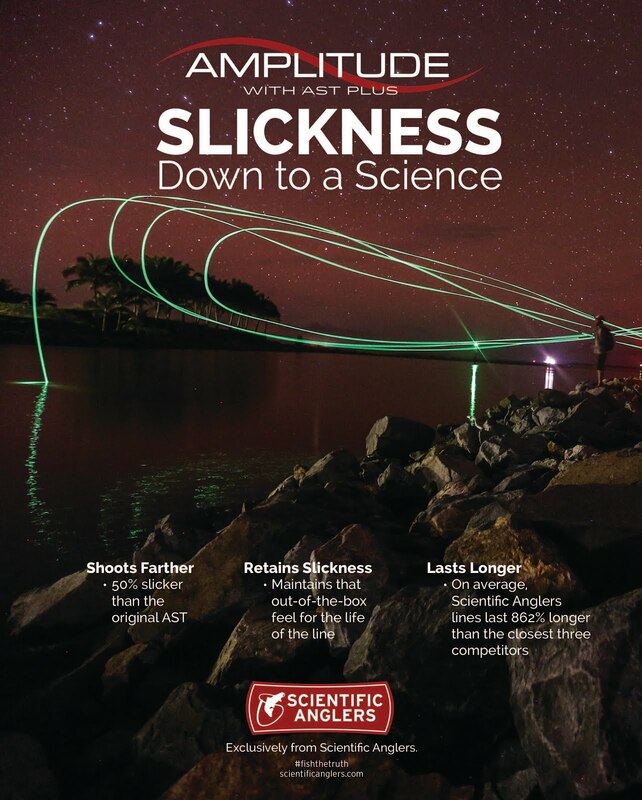 Most of the time you will only witness this when throwing a dry fly or a streamer in clear water. Refusals can be for a hundred different reasons, be it color, size of fly or other reasons such as leader size or a sloppy cast. Alast, fish can’t talk (with the exceptions of jack crevalle and drum.) so you don’t really know what they’re thinking until they eat, but that’s for another story. In short, don’t get intimidated, be it by your fly vice, other tiers, or fish. Keep your friends that like your flies close and the fish that like your flies closer.